Help I Need A Dog Trainer! If you have determined that you need the help of a trained professional to work with you and your pup, you have probably been bombarded by a royal ton of random people claiming to be the best, the only person available who speaks dog, the only dog trainer in existence who holds the key to your dog’s happiness and lifelong obedience. You have likely been offered more guarantees than you can possibly count, each swearing by different methods. Some claiming to be firm and disciplinary, others claiming to help you become your dog’s ‘pack leader’, and others who simply charge so much because of all their years and schooling making them the masters of dog psychology (this is all dripping with sarcasm). There are so many options and so many individuals saying that their way is the best way. Unfortunately, if you choose the wrong way this can cause increased psychological harm in your beloved pet. So, with this being the case, how do you navigate through this vast ocean of alternatives and select the trainer who is actually qualified to work with you using healthy, safe, and positive (and let’s not forget effective) techniques? decide what the purpose of finding a trainer is. Do you want your dog to learn to be calm and not attack everyone and everything? Or do you just need your dog to learn basic commands… before choosing a trainer you need to know the purpose of training… have specific goals in mind. you need to draw a line in the sand about your ethics and be assertive about them. 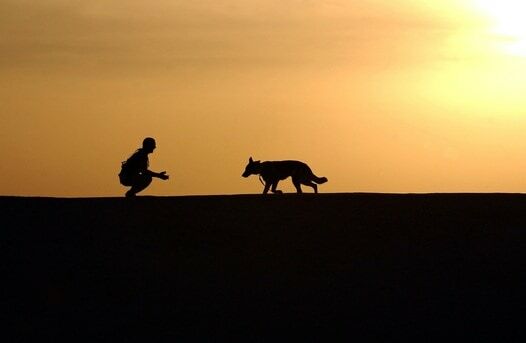 Different people have different philosophies and ethics when it comes to training dogs. Do your research and make sure you have a clear idea of what you feel is okay and what isn’t (for example – choke chains, training spray, etc.). It is essential that you have a dog trainer that agrees with your values and supports them. while there are many truly talented dog training and behavioral professionals who aren’t certified trainers, and while there are no solid rulebooks that necessarily dictate that a certified trainer is an expert, it is recommended that you search for a trainer with credentials. Certification does ensure that the trainer you hire to work with your beloved pup has had to pass some minimum requirements. Still not sure who to choose? What are your friends and neighbors saying? Word of mouth is often the best way to find the best of what you are looking for. Ask people who are previous clients to find out about their methods, experience and success rate. Finally, listen to your instinct. If you feel that something is wrong, don’t ignore the instinct! It is your furry family member’s wellbeing that you are concerned about… you are justified in this! AND … Don’t hesitate to be part of the process. If your trainer wants to exclude you, consider this to be a red flag. It is you that your dog has to respond to, you who lives with your dog, and you who is the paying customer! So don’t feel guilty for asserting that you want to be part of the process.